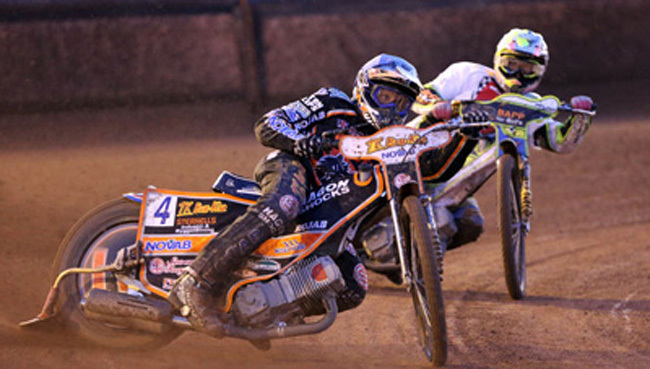 PARRYS International Wolves claimed their first win of the season with a 49-41 victory over Belle Vue at Monmore Green. Wolves put in a determined effort in their first home meeting of the campaign, recovering from a shaky start to claim a hard-fought triumph. Back to back 5-1s in heats nine and 10 gave Peter Adams’ side the upper hand before a fine heat 15 victory from Freddie Lindgren ensured the Aces left empty handed. All seven riders recorded race wins in what was a hugely encouraging all-around team performance, and team boss Adams was delighted with victory against a highly-rated Belle Vue side. Said Adams: “It was a terrific performance I thought, and it gives us a lot of encouragement because Belle Vue are obviously a very strong team. Freddie Lindgren recovered from a slow start to reel off three vital wins in the second half of the meeting, whilst skipper Peter Karlsson top scored as he again notched double figures. Swedish compatriot Jacob Thorssell and Ricky Wells both battled to solid scores, with both involved in the crucial maximums which swung the meeting in Wolves’ favour. Wells forced his way past Craig Cook and Steve Worrall to hit the front alongside the composed Lewis Blackbird in heat nine before Thorssell fended off the hard-charging Matej Zagar in the very next race. Tobiasz Musielak triumphed in that race; displaying plenty of speed when he hit the front to give his confidence a major boost on what was a tough Elite League debut. With Blackbird and Josh Bates both outscoring their Aces counterparts at reserve – Bates claiming the impressive scalp of Cook in heat four – Wolves had the strength in depth to overcome a tough test and get their Elite League points tally up and running. WOLVERHAMPTON 49: Peter Karlsson 10, Fredrik Lindgren 9, Lewis Blackbird 8+1, Ricky Wells 7+1, Jacob Thorssell 6+1, Josh Bates 6, Tobiasz Musielak 3. BELLE VUE 41: Scott Nicholls 11, Matej Zagar 9, Steve Worrall 8, Craig Cook 5+2, Simon Stead 4+3, Max Fricke 4+1, Stefan Nielsen 0.